And the concept of a menacing religious orthodoxy in which a Punch and Judy puppet show plays a crucial role appeals immensely to a dark and tawdry corner of my soul. For all its caustic view of human motivation and social structures, Riddley Walker also pulses with a coarse and antic optimism: An instinct for individual survival that might overcome even the most perverse of group stupidities is built into Hoban’s view of human possibility. Some of Hoban’s other novels (I’ve by no means read them all) are also well worth the time. Turtle Diary became a film with a screenplay by Harold Pinter. Pilgermann, which came three years after Riddley Walker, transposes some of its ideas inventively into the crude and violent realities of the European Dark Ages. Farewell, Russell Hoban. Yes, you’ve disappeared. But in the imaginations of your readers now and yet to come, you’ll reappear many, many times. 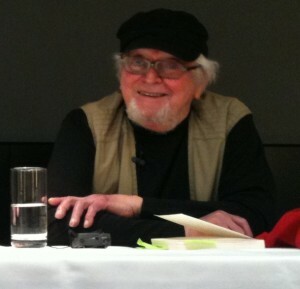 Russell Hoban in November 2010. Photo: Richard Cooper, Wikimedia Commons.